Do you or does someone you know have a bit of a sweet tooth? Would they love to try a range of different flavours, from traditional clotted cream to the adventurous chilli chocolate? Do you want to buy them a gift that lasts longer and is much more exciting than a box of chocolates? If so, our Fudge Subscription Box is a great option for an unusual edible gift. Whether it’s for a friend, loved one or just as a little something for yourself, a Fudge Subscription Box is a perfect gift for any occasion. Lasting 3, 6 or 12 months, our perfectly packaged, luxurious fudge made in the heart of the New Forest will arrive at your door once a month. You have the option to choose the flavour for each box, or you can leave it to us to surprise you. Whether you’re after the tried and tested flavours we all love or something a little bit different; from our ever-changing Flavour of the Month to our vegan range, there’s a Fudge Subscription Box for everyone. Which flavour will you start with? 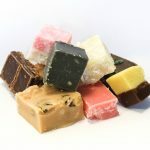 Sign up to our Fudge Subscription Box in store or online today.